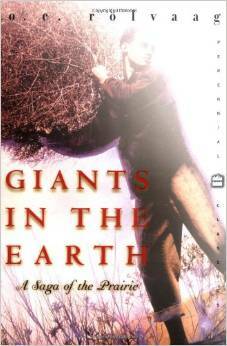 I can’t believe I’d never heard of this book before, “Giants in the Earth“. It was written in 1927 by Ole Edvard Rölvaag, a Norwegian immigrant and a professor at St. Olaf College in Northfield, Minnesota. The book is a fictionalized account of original homesteaders on the South Dakota prairie, and goes into quite a bit of detail about the first few years of settling on the prairie and living in a sod house. The book’s setting is somewhere near Sioux Falls, South Dakota – about 200 miles straight north of Ceresco (my family), and 200 miles southwest of St. Joseph, Minnesota (Dale’s family). And although the characters are Norwegian, their experiences parallel so closely to what I know of my ancestors (and Dale’s) that it’s almost spooky. The book is very well-written and doesn’t feel like at all like it was written ninety years ago. It is long, however, and some might feel that the pace is slow, but it gets very high reviews on Amazon and Goodreads and elsewhere. I just finished it Sunday night and I haven’t been able to stop thinking about it! For those of you who might want to read the book, there are some mild spoilers below, so you might want to read the book first and then come back (although I won’t give away the big plot points, just the major themes). Here are the themes that are explored in the book, along with the parallel events in our own family histories. For reference, most of the action in the book covers the period 1873-1874. My ancestors made their homestead claims in Nebraska in 1869 (John Martinson) and 1873 (Christian Pearson). Dale’s ancestors made their claims in 1865 (Herman Kreifels in Minnesota) and 1887 (Joseph Burkey in Colorado). The Kreifels relocated from Minnesota to Nebraska in 1869. Aimlessly wandering the prairie and asking for directions. When we think of traveling by covered wagon, our visual images are very much colored by Hollywood. We think of long wagon trains with escorts, crossing the prairie on the Oregon Trail or whatever. Obviously, that’s true for some of the settlers in the West but this book describes immigrant families traveling alone or in small groups. They have no maps and in some cases, no set destination. They’ve heard about good land by word of mouth, and they change their plans on the fly when they get new or better information. I know this is true about the Martinson brothers, as detailed in the Aspengren diary, when they arrived in Nebraska in 1869. I also know this to be the case for the Kreifels brothers when they left Minnesota (also in 1869, curiously enough). Some of the characters in the book get lost or disoriented, and it made me think of poor Sebastian Kreifels and his ill-advised trip from Minnesota to Kansas to Oklahoma and then finally Nebraska. Carefully picking the land intended to homestead. Upon arriving at the land that is available for homesteading, there might be several different parcels available. Consideration is given to nearby sources of water and wood (again from the Aspengren diary, there is much discussion about the suitability of the land and proximity to neighbors, water, wood, etc.). The number one consideration, though, seems to be to settle down with people of their own kind. If they are not settling down with family or friends from the old country, then they very much want to find people who speak their language and have the same customs. Mathias Blommer left Missouri knowing exactly where to find the Germans in Minnesota. Herman and Sebastian Kreifels rejected a settlement in Kansas because there were no Germans there, and the Aspengren Diary is all about the Martinsons finding fellow Swedes in Nebraska. Sod houses. Sod houses seem like such a cliche, but the homesteaders really did live in them and in some cases, for many years. It would have been like camping for years on end. I can’t even imagine! The Aspengren diary explicitly mentions John Martinson’s sod house. And I know from family lore that my great-grandmother Hulda cried when she moved out of the family’s sod house into the frame house because “the floors were too hard”. Hulda was born in 1875, so if she had a memory of the sod house (age 4?) that means the Martinsons lived in their sod house for about 10 years. In Dale’s family, the Kreifels brothers lived in sod houses upon their arrival in Minnesota in 1855. I don’t know when they may have built their frame houses, if they did at all! The Burkey family lived in a sod house out near Julesburg and as far as I know, a frame house never got built. Christian Pearson, on the other hand, settled his land in 1873 and according to his homestead papers, built a house of lumber that same year. Inexperienced farmers. The main characters in the book were fishermen from Norway and had no prior experience with agricultural production. I know that the Rademachers were townspeople back in Germany and would have known very little about farming. My Swedish ancestors and also the Kreifels were all rural people but the scale of their farming experience would not have compared in any way to the large expanses of land in the West. Certainly they were pretty used to subsistence living and probably knew about milking cows and butchering poultry and pigs, that kind of thing. But tilling large expanses of open ground would have been new to them. They were farmhands back in the old country, not land owners. They had to learn through trial and error and word of mouth about when to sow seed, how to harvest, all that kind of thing. Encounters with Native Americans. In the book, the families have a few encounters with Native Americans, who by then are landless and living in poverty. The Kreifels family also had encounters with Indians, both in Minnesota (hiding during the 1862 uprising) and then in Otoe County (giving away food to wandering Indians). I have not heard of any encounters on my side of the family. Depression and mental illness. Wow, this is a big thing in the book and it really rings true. Not everyone would have been mentally equipped for the hardship and isolation of homesteading. In the book, it’s mostly the women who struggle and that makes sense when you think about it. Men who felt intimidated by the pioneer life would never have undertaken it in the first place. But the men who did make this choice for their families may have done so without fully considering whether their wives were up to it. I’m pretty sure that Nilla Martinson was. She made that sod house such a happy place that her daughter Hulda didn’t want to leave it! She and John raised seven children who all seemed to thrive – I don’t think John could have done it without Nilla’s support. I’ll be writing soon about Josephine Ortman, the wife of Louis Kreifels. She clearly was not up to it. I wonder about Johanna (Nilsdotter) Pearson, wife of Christian. She seems to have persevered but she endured a lot of hardships, not the least of which was the death of her first two children in a house fire. I also think about Gustafva Brodd who, although not technically a homesteader, was able to keep five children alive and well in dangerous Carbon, Wyoming before moving to Nebraska. She supposedly baked bread on the side and sold it to the miners to make extra money for the family. She seemed to have had what it takes to make a go of it under extremely challenging circumstances. While I am now writing about the locusts, I also want to remark to you what happened during the earlier years when we had the locusts. Our congregation made a promise with our parish pastor that we every year would hold a procession with the parish priest and with cross and banners to Jacob’s Prairie, which is about seven miles form St. Joseph to praise God that he took the hardship of locusts from us. Thank God that we were heard. The locusts, that same summer, had gone away. The first years almost all the people faithfully held to their promise and took part in the procession. But after many years, and the locusts did not return the people became lax, and the procession always became smaller. But our pastor always held firm to the promise. Now that the locusts have again returned, the people have almost all beautifully improved. Last Sunday was the yearly date that we here with the procession again returned to Jacob’s Prairie with the Priest, cross and banners. The men’s and women’s sodalities were also represented with their banners. The procession was once again as large as it was the previous year. Twenty wagons followed the procession on which most of the elderly men and women sat. Our John drove also with his wagon in which I was in, and which was the way I rode home. As we were arriving closer to the church, then came the members that belong to the Jacob’s parish with cross and banners and met us and accompanied us to the church. Immediately thereafter, the procession from Ritschmond. They also had seven miles to travel to Jacob’s church and the Jacob’s parishioners also went to meet their procession and escorted them to the church. Forty-two wagons followed the Ritschmonder’s procession. Because the church was too small to hold all the people of the three large communities, an altar was built outside the church where the priests celebrated the High Mass and preached. After the High Mass, a half-hour was spent for some eats and drinks and again the procession was assembled and with prayer and song returned again to St. Joseph. The importance of Church. One of the most memorable parts of the book for me was the arrival of the Lutheran minister to the small homesteader community. The minister character is so beautifully written. You really appreciate why the homesteaders were so anxious to build their churches. John Martinson was one of the founders of the first Swedish church in Swedeburg, Nebraska, and I thought about what I have read about S. G. Larson and Andrew Hallner – early ministers who served that community. The book also delves into misplaced religious expression and its negative effects on the mentally ill. Challenging stuff. Guilt about pregnancy before marriage. I was surprised to stumble across this sub-plot. One of the characters in the book carries a great deal of shame about this. My great-grandparents, Gus and Augusta Rudeen, arrived in America unmarried and expecting a child. I still do not know to what extent there was any shame about this back in Sweden. I have heard mixed opinions about this, with one expert telling me that is was prevalent because the Church charged a fee for marriage and then charged an even bigger fine for an out-of-wedlock child. So it wasn’t at all uncommon for poor couples to live as man and wife but postpone the marriage up until it became necessary to avoid the fine for an illegitimate child. Certainly Gus and Augusta addressed the situation right away – they arrived in New York on October 21, 1882 and were married less than a month later in Waverly, Nebraska on November 19, 1882 (the baby, Minnie, was born on March 29, 1883). Rölvaag wrote two sequels to this book – Peder Victorious and Their Father’s God. I’m intending to read both of them! Karen, I picked up my copy from the library yesterday (Monday) and read 100 pages last night. It is a long story but well written and an easy read. Actually, a page turner! How interesting that our families and the Rademacher families were all homesteading in these years and shared similar experiences. Loved your book review and am eager to keep reading! I also ordered the book right away after reading your review. I look forward to your emails. I’m planning on sharing the book with the rest of the family here in Albuquerque.